(1818, Amsterdam, The Netherlands -1897, Delft, The Netherlands). 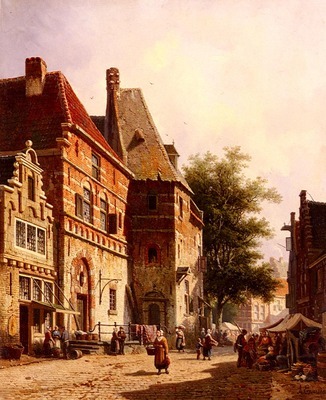 Eversen lived and worked in Amsterdam, exhibiting there between 1840 and 1885. Eversen was highly regarded during his lifetime and he sold many paintings in Belgium and Great Britain as well as in Holland. Eversen was a member of the elite association of artists known as the Arte and Amicitiae. His works are detailed topographical paintings which are interesting from both an artistic and historical point of view.